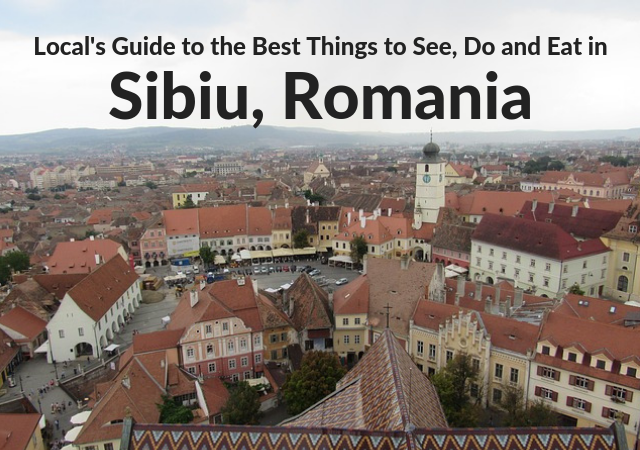 Wondering what to do in Sibiu? 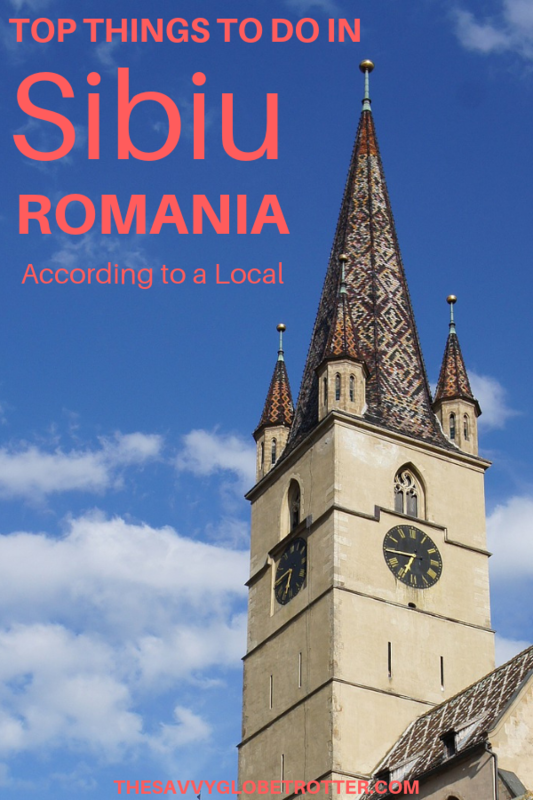 Read on for the best things to do in Sibiu, where and what to eat and other essential insider information as written by a local. The historic part of Sibiu is pretty small and easy to walk from one edge to another of the old town. Start your trip in the heart of the medieval town, in the Huet Square. There you can climb the tower of the Evangelic Church, from where you will have an impressive panorama of the whole city and its surroundings (including the Transylvanian Alps). From the Huet Square, pass through an archway and head to the Lesser Square, the old merchants square. The square is now packed with pavement cafes but it also houses two museums: History of Pharmacy and Ethnographic Museum Franz Binder. At the limit between the Lesser Square and the Lower Town, don’t forget to go on the so-called Liar’s Bridge – a bridge with a lot of legends among which the famous one encourages couples to no tell lies to each other while on that bridge. From the Lesser Square, pass through the vaulted corridor located at the ground floor of the Council Tower and you will be in the Large Square, or the administrative square of the old town. 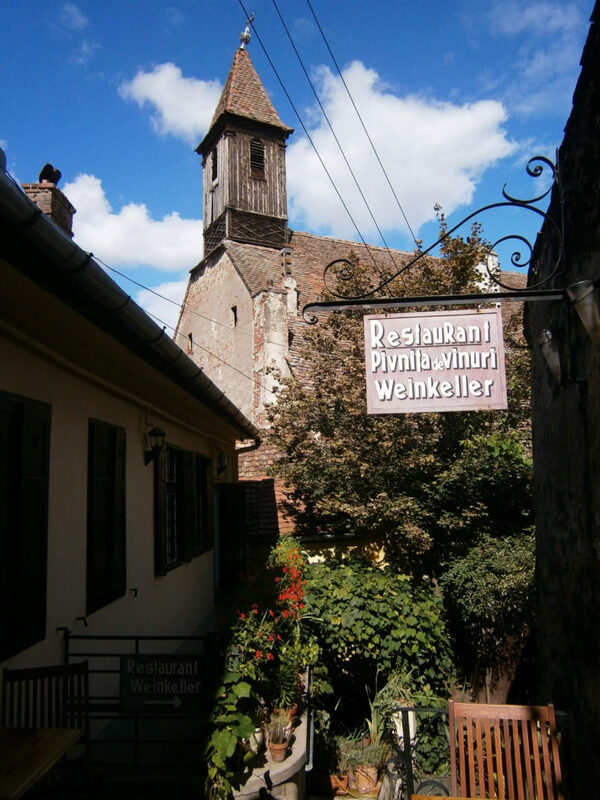 Here you can visit the Catholic Church, the Brukenthal Museum (the oldest museum in the country), and don’t forget to enter the courtyard of the Haller House where you have medieval frescoes very well preserved on the external walls. After exploring the urban complex of the three medieval squares, head toward the northern limit of the old town and have a cafe on ‘the most beautiful street in Sibiu’ – Cetății Street (the fortress’s street). It will be easy to recognize it once you are there because you will see the only leftovers from the medieval fortifications of the town. The 300-meter long old wall is dotted by three defense towers, which are very well preserved and you will get an idea of how this part of the town looked like by that time. 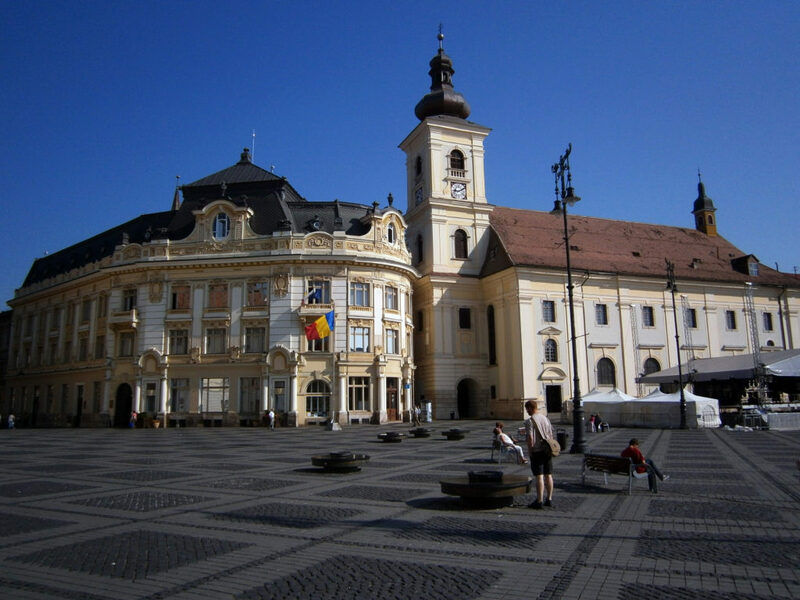 All the above-mentioned monuments are located in the Upper Town of Sibiu. If you still have energy, do not miss the Lower Town. There you can go to the Asylum Church, an Orthodox Church that it is still in use today and it’s the oldest church in Sibiu. For the rest of the day, just wander the old winding streets of the Lower and Upper Town and enjoy its countless picturesque angles for photogenic pictures. If you come to Romania, and especially to Sibiu, you must try the tripe soup (ciorbă de burtă). The best place to taste it is actually a local eatery, called Kon Tiki (Strada Tudor Vladimirescu 12). Only locals go there but believe me, the tripe soup there is the best one in town. If you want to try a second dish too, order small sausages dressed with mustard (mici cu muștar). However, Kon Tiki is a 20-minute walk from the town center but I say that it worth to go there and see something different in Sibiu. If you don’t have time, another restaurant where you can experience the Romanian gastronomy is located in the very heart of the Lesser Square and it is called Crama Sibiană. Sibiu is a medium town so it is very easy to walk around the historic center (maybe it takes half an hour to walk from one edge to another of the old town). 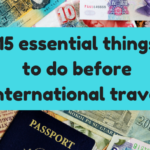 However, if you have luggage and need to go to the train station or the airport, consider taxis (cheap in town) or the local buses which run very often. We don’t have Uber yet, unfortunately. The best time to visit Sibiu is in autumn (September) when days are still warm and the fall colors start to appear on the leaves of the trees. It is also the best time to hike in the surrounding mountains (Cindrel and Făgărași) as the weather is more stable than in summer. If you plan a city break in Sibiu, then this is a good decision because you have enough time to visits its countryside surroundings, too. One morning, go for a half-day trip to the Village Museum Astra, situated on the outskirts of the town. You will have the chance to see many old houses brought from the surrounding countryside and displayed in this museum like in their natural setting. For the rest of the day, you can continue your trip and go up in the mountains at the resort called Păltiniș (30 km from Sibiu). There you have beautiful panoramas, picturesque hamlets and wooden cottages temporarily used by shepherds in summer. If you have another spare day, don’t miss the Mărginimea Sibiului area and some of the fortified churches that dominate the Saxon villages around Sibiu. 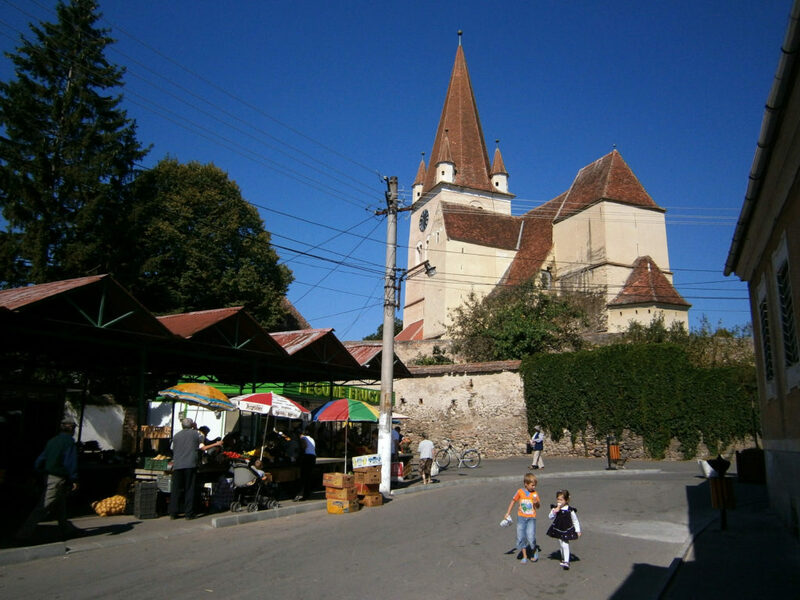 The best way to get around is by car (rented) so that you can easily follow this circuit: Sibiu – Cisnădie (fortified church) – Cisnădioara (old basilica) – Gura Râului (old Romanian settlement) – Sibiel (glass icon museum) – Săliște (small Romanian town) – back to Sibiu. If you have more time and want to spend the night at higher elevations, then Jina shepherd’s village is a good choice (70 km from Sibiu, following a panoramic road with almost no traffic). 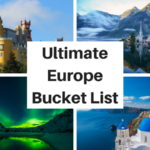 Iuliana is a passionate explorer, travel writer, and blogger at Authentic Travels, and she is based in Sibiu, Romania. She travels at a slow pace and to remoter places. Riding a camel amidst sand dunes in a desert, that’s the moment she feels authentic. Follow her on Facebook, Instagram and Twitter. It is really stunning and quite romantic place to visit!